Wood carving classes with Dimitrios. 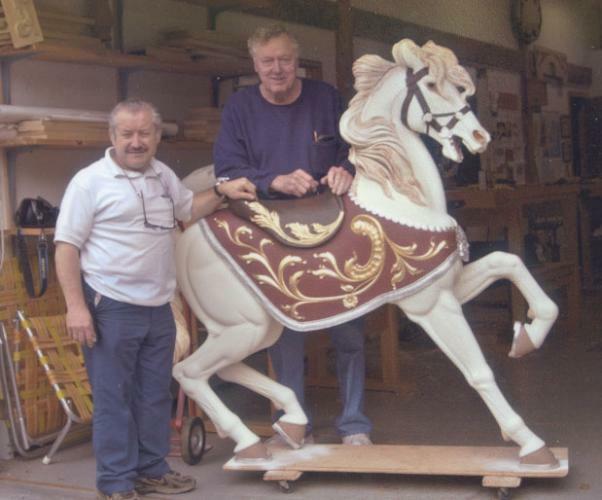 His students range from dedicated amateur woodcarvers to seasoned professional woodworkers. Whether beginner or experienced artisan, Dimitrios helps all to define and reach their individual goals for craftsmanship and artistry. Guild Member Dimitrios Klitsas and his art are heir to a classical lineage of many styles which draws upon a long refined tradition. This lineage has not generally prospered in our time but nonetheless has come to a vigorous flowering in his school for woodworkers where a dedicated community of students gather to study with the master carver and teacher. He teaches the skills of the professional artisan, as they were taught to him, beginning with how to stand before the work and how to hold and maintain the tools. Self taught carvers of long experience have said that they are now able to work long hours without pain because of finally learning these basic skills. Every student has different goals and abilities, but if they can apply themselves and respect the tradition, he welcomes their commitment and will work with them to see that they progress. It was by good fortune that Dimitrios was brought into this tradition. In his youth, in his home town on the Greek mainland, he went to a technical school where professional woodcarving was taught. The teacher happened to be an accomplished artist and university professor, Angelo Moskos, with whom he apprenticed after leaving school. Besides technique, he was taught drawing, the elements of design and the process of producing art, all of which he passes on to his students. He encourages them to work in the widest variety of styles but urges them to be humble when attempting each one. Demitrios Klitsas offers one to two week intensive workshops periodically throughout the year and a three hour class every Wednesday from October to May. All classes are conducted at his studio in Hamden, Massachusetts. For information about schedules and cost, visit his web site at http://www.klitsas.com/woodcarving_classes . List of Wood Carving Teachers. This entry was posted in Fine Art and tagged Massachusetts, Sculpture & Wood Carving. Bookmark the permalink.